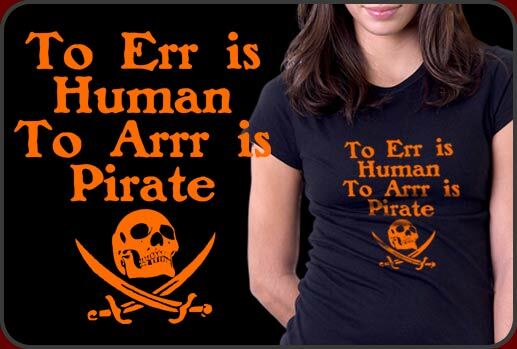 To Err Is Human To Arr is Pirate! Avast ye devils! There be booty in them digital seas and beneath the Jolly Rogers we means to find it! It is true that to Err Is Human To Arr is Pirate. Indeed the cries of "Arrr!" can be heard from our pillaging ship as we traverse the expanse of the dangerous digital waters in search of riches. You are no ordinary meat suit. No you write your own destiny. You boldly stare down the monstrous corporate law firms and stab swiftly into the heart of RIAA to claim your booty. To err is certainly human, but to ARRR, that is only for free willed spirit of a pirate. Our To Err Is Human To Arr Is Pirate shirt design prints beautifully in nearly every color shirt you choose but in our opinion, should only be seen on black. We have tons of great merchandise featuring our To Err Is Human To Arr Is Pirate design from t-shirts, sweatshirts to coffee mugs caps and buttons.